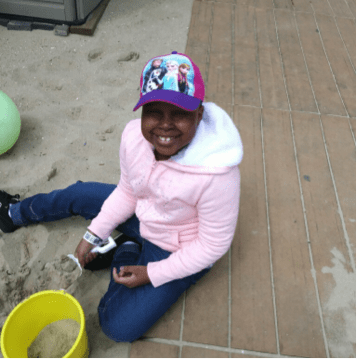 Jaslene is a sweet seven-year-old girl who is suffering from renal medullary carcinoma, a rare cancer of the kidney. Her cancer has not taken well to treatment and she remains in severe pain that limits her ability to walk. In addition to her physical suffering, Jaslene’s family has suffered financially. Her mother, Karen, is a single parent with a limited support system. She is Jaslene’s only caregiver and needs to be by her daughter’s side at home and at the hospital. This leaves Karen unable to work. She had a full-time job as a nursing assistant at an assisted living facility prior to Jaslene’s diagnosis. Karen ensured that her family was financially stable and did not have any problems managing bills. Now that has changed and Jaslene’s family is under constant financial stress. Young Jaslene remains bright and strong throughout her treatment. Jaslene’s disease has also resulted in many added out-of-pocket expenses for the family such as food and travel. This combined with a loss of income left Karen struggling to pay the family’s rent and other bills. Jaslene’s family was issued a grant made possible by Family Reach’s dedicated community. This assistance helped with several of the family’s rent payments. It allowed Karen to focus completely on Jaslene’s care without having to worry about finances. We keep Jaslene in our thoughts as she continues with her treatment! Click here to provide life-saving support to families like Jaslene’s.